Michael J. 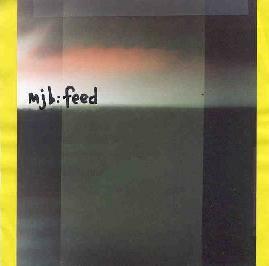 Bowman - "Feed"
Michael J. Bowman is good at taking pop music and turning it on it's head. On Feed, we find him moving into heavier progressive rock territory that nonetheless doesn't forsake his pop leanings. Among the highlights is the opening track, "Another Winner", which brings his brand of lo-fi pop music to the prog rock stage, featuring a catchy driving melody played against a potent keyboard backdrop and a thudding bass line. Of course things shift gears a few times throughout the track's 8 minutes as the music moves into more rockin' territory along with bits of Keith Emerson keyboards and growling efx'd vocals. It's a wild mixture (which is half the fun) and quite an enjoyable tune. "My Posthumous Baptism" kicks out electro rhythms against which an organ plays the guiding melody. We're still in the prog rock realm though there's a second trippier organ that gives the music a slightly psychedelic edge. Nice tune. "Jerusalem" took me by surprise with its mid-70's King Crimson gone lo-fi sound. Dig that classic Wetton styled bass, just like in the old K.C. improv jams. Of course it abruptly changes direction near the end becoming an oddball avant-pop tune with quite nice female vocals that end up drifting through the efx unit. "Australian Puppet Show" and "Meatiest Rotisserie Chicken" both get a bit into freaky jazz territory. The former is a dark, heavy progressive rocker with a touch of jazz fusion. And "Meatiest Rotisserie Chicken" includes an organ freakout that sounds like a combination of Soft Machine and Sun Ra hitting the dance floor. One of my favorite tracks. I've heard a number of releases from MJB now and they've all been a bit different, and each impressive in its own way. Check out our artist index under Cloud and Insect Darts for reviews of his other works. Really interesting stuff. For more information you can visit the Semper Lofi web site at: http://www.semperlofi.com. Contact via snail mail c/o Mike Bowman, 42 Kalina Drive, Rhinebeck, NY 12572.